OGX’s Moroccan Sea Salt Spray is one of my go-to products at the moment. My hair naturally has a loose wave to it; however I’m always looking to make that more distinct and consistent. In the past I would have pulled out my curling wand to get that wavey look, but not anymore. As someone with fine fragile hair that gets damaged easily, constantly resorting to curling was not the healthiest nor smartest option. In efforts to repair my damaged hair, I’m avoiding heat at all costs, so to have found an alternative to get the look I wanted through the use of sea salt spray was a godsent. -It does give hair a “tousled” and beachy look. -I wouldn’t say this product is weightless. After a few sprits it does leave the hair feeling slightly heavier and like there is a mild build up of product. -Despite the weight, it does texturize, thus giving hair a fuller look. -While it supposedly has moisturizing qualities, this product does dry out my hair leaving it a bit crunchy at first, like hair spray. -It eventually contradicts that dryness by leaving a light greasy residue on the surface after hours into wearing it. -The point of a sea salt spray, though, is to make some waves and this product absolutely does that. -It smells so fresh, as if you’ve just walked onto the beach. -Spraying this in your hair will leave it styled nicely for hours. As with any product, there are always drawbacks, and this one is no exception to that. Regardless of those few and relatively minor ones, I keep reaching for this product and am generally impressed with the results. Over these next few months, no doubt this sea salt spray will continue to be an essential of mine in efforts to avoid heat. Have you tried this product? 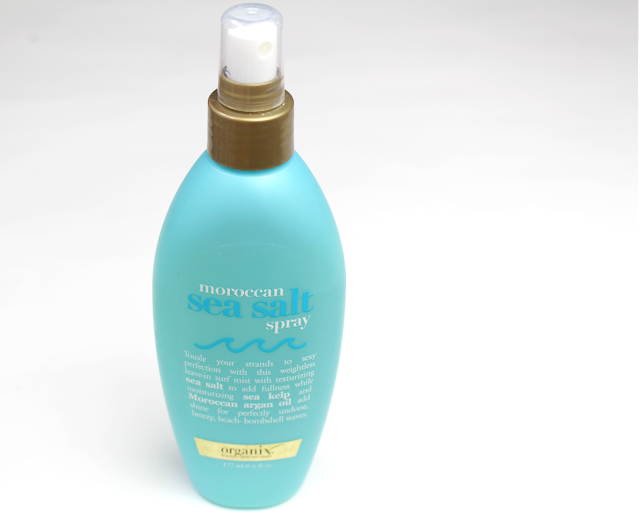 Do you have a favorite sea salt spray? So do you apply this to your hair after drying or before? I am trying to have more or a natural look but have been using my curling wand to do so I don't want to use heat anymore. A salt spray is on my list of summer necessities!